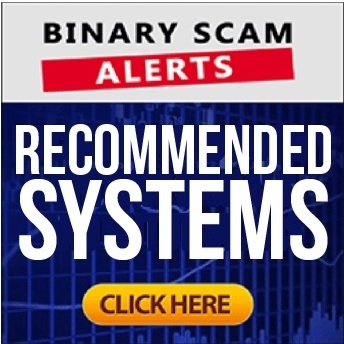 Binary Scam Alerts is posting a long awaited review and SCAM notification in regards to the GPS Trader Software, App, and Auto-trader as well as Richard Heffner the so-called founder and CEO of this dangerous trading tool. Our staff has just received a series of complaints from agitated day-traders getting a steady drip-feed of very aggressive, misleading, and targeted email messages illegally soliciting them to join a money-making scheme which offers them massive rewards with little or no risk to their money. Obviously we have identified similar deceptive behavior in the past, so we decided to investigate this system and our results are very clear and decisive. We have stumbled in to a confirmed binary options internet investment scam, with an added level of sophistication. According to the New Scientist, in 2007 two navy ships in the San Diego harbor were conducting an exercise in order to test a new communication protocol. While jamming radio signals they inadvertently blocked signals from GPS satellites across the city, effectively neutralizing the air-traffic controllers’ ability to navigate the planes and instruct them concerning landing procedures. The panic stirred by this mishap cost a few people their jobs, but more importantly it caused the decision-makers to re-evaluate the technological protocols and revise policies in order to avoid similar cases. This exact same technology is known as GPS timing and is used to time-stamp financial transactions, such as stock-market trading. What does all this mean? 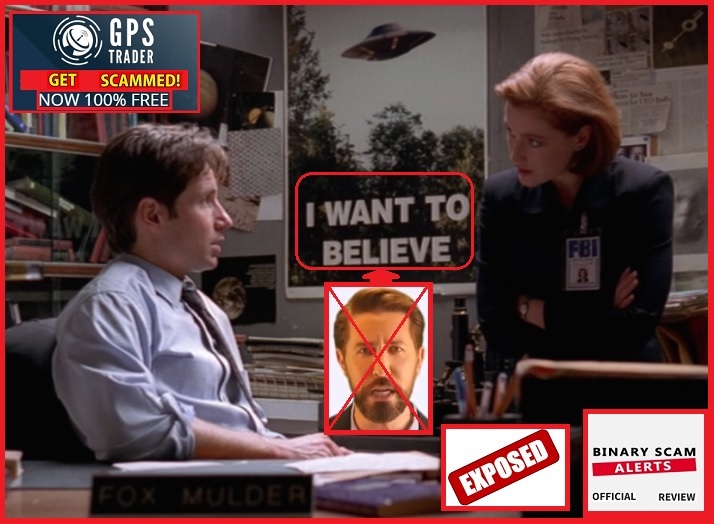 Nothing, it’s merely a crude attempt to distort and manipulate facts related to GPS technology and historical events while putting on binary options trading twist. This notion or idea of loopholes in GPS technology has been used and rehashed in a variety of cases, and as we all know there’s nothing like the truth to hide a good lie. The point behind this exercise is to demonstrate how this is a very carefully thought out scam. It’s plain to see they were aided by professionals and have now perfected their ploy and using misdirection as a very effective sales tool. To illustrate, this guy is saying that his system executes trades “4 millionth of a second before the fastest Wall Street Traders”. I believe this is borderline delusional, and harping on the latency concept will only work to a certain degree. There are no charts or scientific findings which validate his claims, and with good reason. 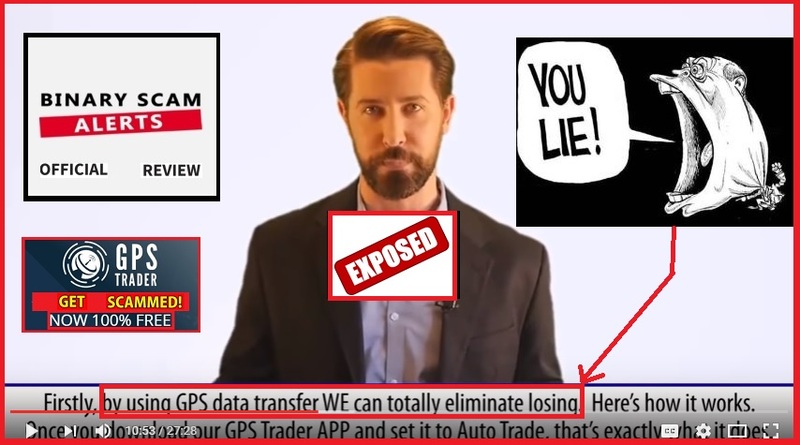 This person actually says that by “using GPS data transfer we can totally eliminate losing”. What a revelation! I must say this is absolutely some of the more colorful scripts I have encountered, and definitely extremely dangerous since they have obviously hired a creative copywriter to come up with this fable, only they took it a bit too far in my opinion. Well, don’t put away your credit card just yet, and you may very well need your Paypal account. It will cost you at least $250 to use this system, and it will be paid to your broker’s trading account. These include but are not restricted to: Binary Matrix Pro, The Azure Method, Millionaire Blueprint, Disrupt Trading, Quick Cash System, The Free Money System with Walter Green, Make Money Machine, Regal Wealth, Push Money App with Dennis Moreland, Cloud Trader, Profits Infinity, Lie Detector Millionaire, and Google Trader. Try to stay away from these dodgy systems and stick with the recommended ones only. 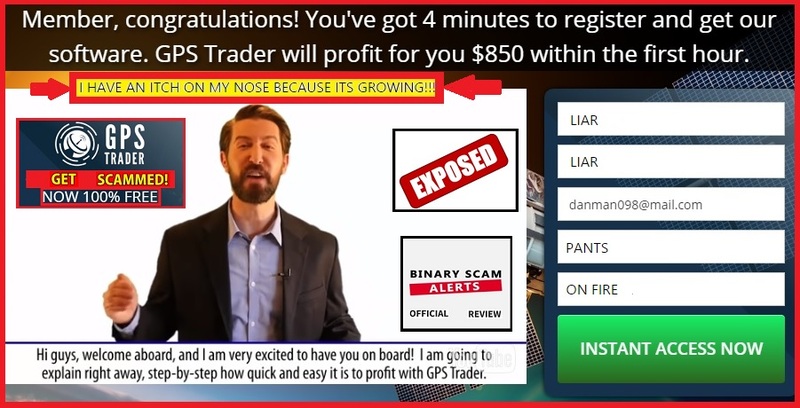 The GPS Trader Software, App, and Auto-trader as well as Richard Heffner the fake actor is a verified binary options investment SCAM with a nasty science fiction twist. I must commend these scoundrels and give them two thumbs up for originality, but that’s about it. This system fails the most basic requirements of our credibility test and scores a big fat zero on transparency, and accuracy. The customer service responses were cryptic at best when we tried asking them difficult questions about withdrawals, and the broker selection process is non-existent. Due to the compelling evidence we have produced it is quite evident we are dealing with one of the nastiest and diabolical schemes being marketed online today to potential day traders. We could not find one thing which is genuine, honest, or sincere about this system and we are convinced it will intentionally lose trades and steal your money. Proceed with extreme caution if being illegally solicited by someone you trust, chances are they are getting paid on the back end or simply have not recognized the severity of the situation. Join our Facebook group and subscribe to our YouTube Channel to get informed.